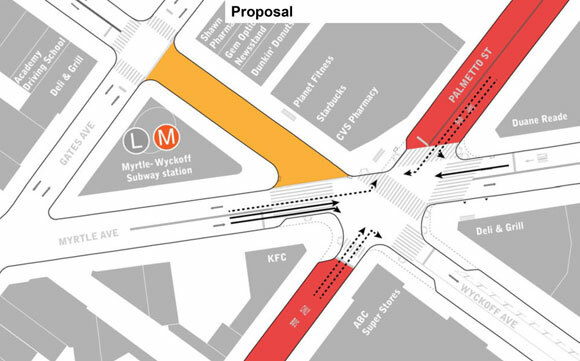 Last night, the Queens Community Board 5 transportation committee endorsed DOT’s safety plan for the Myrtle-Wyckoff transit hub on the border between Brooklyn and Queens, including the creation of a one-block pedestrian plaza on Wyckoff Avenue between Gates and Myrtle [PDF]. The project straddles two community board districts and was voted down by Brooklyn CB 4 last week. DOT can proceed without a vote from CB 4, however, if the agency chooses. Council Member Antonio Reynoso has said he supports the project and wants the city to take action. The stakes for public safety are high. Three pedestrians were struck and killed at the intersection between 2009 and 2014, including Edgar Torres, who was hit while he had the right of way despite an initial round of changes to simplify vehicle movements at the site. The current project would do much more to prevent pedestrians from being struck by turning motorists. Following a DOT presentation last night, the committee held two separate votes: one unanimously in favor of the plaza, and a second in favor of converting Wyckoff between Myrtle Avenue and Madison Street to one-way southbound traffic flow, which would reduce the number of potential conflicts between drivers and pedestrians. Only one committee member voted against the latter motion, according to CB 5 District Manager Gary Giordano. “The committee was compelled by the notion that reducing the intersection from 20 possible movements to five would make it much less chaotic and much more understandable for pedestrians and motorists,” said CB 5 transportation committee member Toby Sheppard Bloch. The full community board will vote on the project at its July 13 meeting, which begins at 7:30 p.m. at Christ the King High School, located at 68-02 Metropolitan Avenue. I was on the Q58 on Fresh Pond Road and a truck was double-parked in front of the bus and unloading. The bus had to wait to change lanes to get around the truck. I asked the driver is this was OK. He said no it was not. I asked a bus driver parked on the proposed Wyckoff Avenue plaza location what he thought about a plaza. He said I don’t think it is going to happen. Nice 54 page PDF referenced in this comment. The word MTA appears only once in this document. If anything, the DOT should come behind the MTA doing their things first. Double-parking and similar problems will shift to other streets. This post is three months old and some of the suggestions in it have not been implemented yet or repeated in any news article referring to the proposed plaza. Two of the most important changes only need a ladder and an adjustable wrench. I could go on for 54 pages but … gotta catch a bus. NYCDOT should allow buses to make a right turn from Myrtle Avenue westbound to Palmetto Street northbound and then have the Q58 and Q55 buses utilize this routing to enter the Ridgewood Terminal eliminating many turns on the current Q58 route and the recently proposed Q55 route mentioned at the July 25, 2016 MTA/NYCT Committee meeting. Also as part of this proposal NYCDOT could then eliminate left turns from Palmetto Street southbound to Myrtle Avenue eastbound as well as from Myrtle Avenue eastbound to Palmetto Street northbound since no bus routes follows these two route paths. For example the B54 route traveling east along Myrtle Avenue to the Ridgewood Terminal turns left at Gates Avenue not Palmetto Street. This would therefore eliminate two more unnecessary left turns within the Ridgewood Terminal area as part of the Wyckoff Avenue Pedestrian Plaza proposal in favor of a right turn from Myrtle Avenue westbound to Palmetto Street northbound and hope NYCDOT & the MTA will act upon this. I think the proposed B26 and Q55 routes are the best imaginable. Thanks for posting the MTA proposal. It is getting late, you may want to share your thoughts with the DOT and the MTA directly. Thanks to StreetsBlog for being a serious place to comment, but please reconsider using the word sorriest to refer to bus stops. How about: American bus stops: City A vs. City B. Transit authorities need to do a cost-benefit analysis of maintaining them.